The Accidental Prime Minister: Anupam Kher Shares Pic From Sets. Wait... Can You Spot Akshaye Khanna? Anupam Kher, who is currently shooting for his upcoming political drama The Accidental Prime Minister, which is based on the life of former Indian Prime Minister Manmohan Singh, shared a glimpse of his last schedule in Delhi. The photo features Anupam Kher dressed as Manmohan Singh and Akshaye Khanna, who is also part of the film. Akshaye Khanna plays Sanjay Baru, whose book with the same title is the inspiration of the feature film. "Delhi schedule of The Accidental Prime Minister comes to an end. Thank you Delhi for your love, warmth and support. It was a delightful experience to work with some amazing actors from this city. And it is a sheer joy to be acting with the brilliant Akshaye Khanna who plays author Sanjay Baru in the film. Akshaye not only is a phenomenal actor, he has also helped me bring out my best as Dr Manmohan Singh. Looking forward to the last schedule of the film," Anupam Kher wrote on Instagram. The 63-year-old actor has been continually updating us with glimpses from the film's sets. Earlier, Anupam Kher had shared a photo from the sets and introduced us to Arjun Mathur and Aahana Kumra who play the characters of Rahul Gandhi and Priyanka Vadra respectively. "Introducing Arjun Mathur as Rahul Gandhi and Aahana Kumra as Priyanka Gandhi," the actor wrote. The actors bear stark resemblances to their real-life characters. Anupam Kher also introduced us to actress Divya Seth, who plays Anupam Kher's onscreen wife Gursharan Kaur in The Accidental Prime Minister. The photo shared by Anupam Kher featured both the actors dressed as their characters from the film. 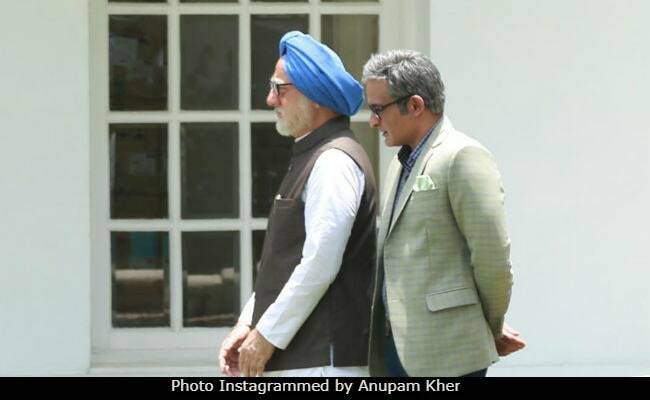 While team The Accidental Prime Minister was shooting in London for the film, a video of Anupam Kher dressed as Manmohan Singh on the sets went viral. The actor later shared the video on his official Instagram handle. The Accidental Prime Minister is directed by Vijay Ratnakar Gutte and will hit screens on December 21 this year.